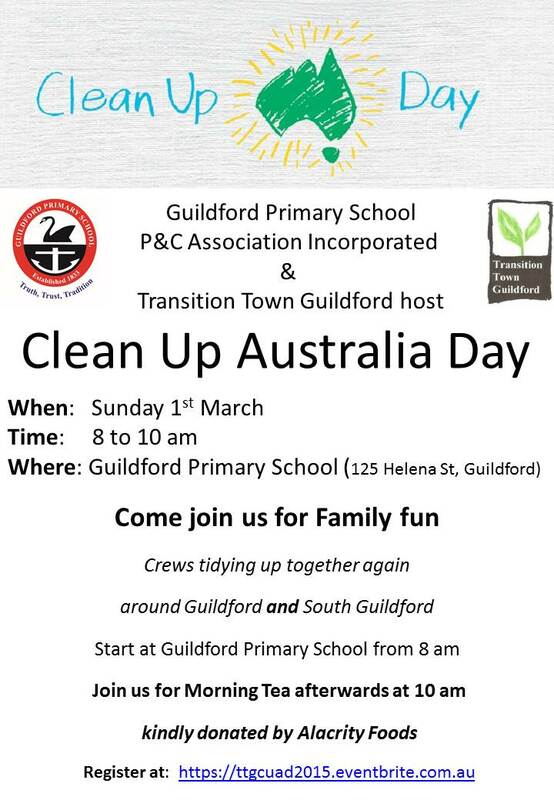 Building on the success of previous years, Transition Town Guildford will be hosting a Clean Up Australia day site around the Guildford Primary school. Come join us to clean up and hang around for morning tea. Children welcome, but must be supervised by parents. Bring: Bring gloves, water, hat, enclosed shoes and a friend! As per previous years, Guildford Primary School students will receive 500 faction points for taking part. When you return your bags join us for morning tea at 10 am kindly donated by Alacrity Foods. This entry was posted in Community, Environment, Event, Take Action, Waste & Recycling and tagged Clean up Australia day, CUAD, guildford, Guildford Primary School. Bookmark the permalink.